As MeToo Founder Tarana Burke said, “We come to the work because we are the work.” These are the inspiring and true words of Tarana Burke, who was the keynote speaker at this year’s National Sexual Assault Conference (NSAC). RALIANCE had the opportunity to attend the conference last week in Anaheim, California. We not only connected with sexual violence prevention advocates across the country, but also sponsored a series of workshops to explore how we can better work toward our shared goal of ending sexual violence in one generation. 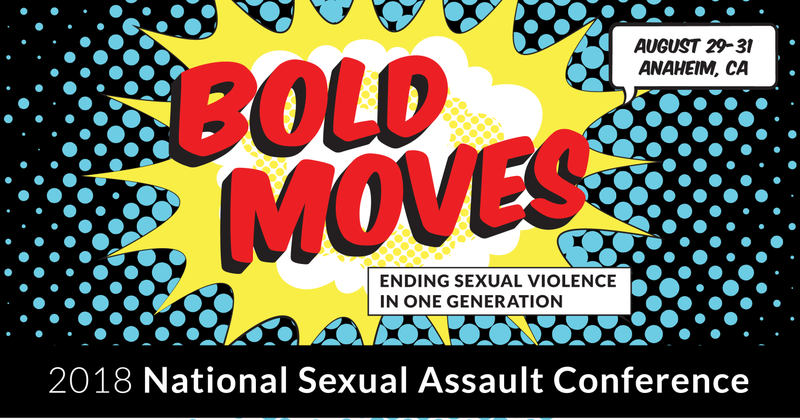 NSAC’s theme, #BoldMoves, was inspired by RALIANCE’s bold vision of “Ending sexual violence in one generation.” Nearly 2,000 allies, advocates, survivors and friends gathered at this year’s conference to inspire and share best practices in our work to change the culture and improve sexual violence prevention and intervention. Keynote speakers Menominee activist KayTeshia Wescott; Dalton Dagondon Diggs from the Idaho Coalition Against Sexual and Domestic Violence; and Melody Klingenfuss, a California Dream Network statewide youth organizer working with the Coalition for Humane and Immigrant Rights discussed the importance of mentoring and engaging youth in this work. Check out the livestream! RALIANCE debuted a new messaging guide at NSAC with strategies on how to be more effective communicating about prevention. We know prevention is possible and happening. Now, the world needs to better understand the role they can play to end sexual violence in one generation. Explore the guide!